I love people choosing to commit publicly to each other. Each wedding I shoot, whether you’re 20 or 50, gay or straight, black, white or anything else, I strive to tell the story of what your wedding is about: love, community, and commitment. Though I’m inexplicably attracted to Jeff Goldblum, I’m married to my lady- friend and wife, Natalie. I’ve focused on LGBTQ folks from the inception of my business and have made those hundreds of queer couples the center of my mission. If you’re LGBT or Q or all/none of the above, I want to shoot you. In a good way. With my camera. As the late-great queer theorist Eve Sedgwick once put it, “People are different from each other.” Difference is what I love most about wedding photography: if I wanted to work in a uniform setting with uniform objects, I’d be a food photographer. Or at least do only one kind of wedding with one type of couple. Yawn. What excites me most about my job is the opportunity to meet widely divergent people, celebrate with them, and carefully craft aesthetically compelling images that have the emotional feel of an old snapshot. I’m a FEMINIST, pet mom, a dinosaur nerd, a huge Jad Abumrad fan, and an avid watcher of The Wire. Also, you should know, I’m half of a wife-wife team. Natalie, whose day job is getting a PhD in Victorian literature, is my second shooting side- kick, co-pet-parent, and the Bert to my Ernie—but not quite as cranky, just practical. 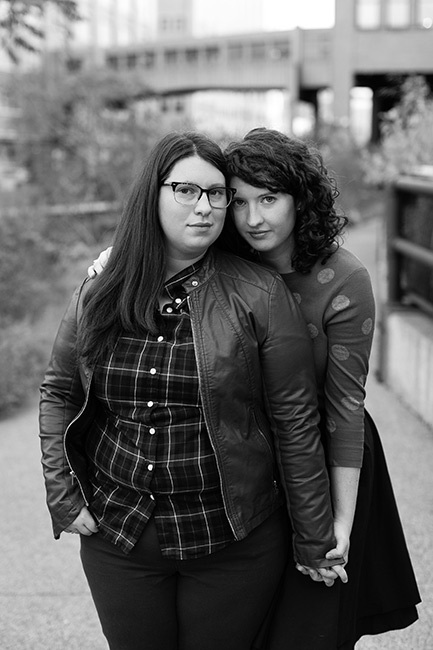 If you’re looking to hang out with some baller lesbians who also take fantastic photos of everyone, we’re your girls. Located in Princeton, NJ but I travel often. Contact me to tell me where you’re getting hitched. Or go ahead and text me 203-513-9377.